You are impressed with the WDTV Live Plus you recently purchased. It plays smoothly and is easy to operate. Don’t you think you could've got even more? Media clients such as WDTV Live Plus from Western Digital enjoy huge popularity and allow reproduction of multimedia content directly from a USB stick, external portable drive, from media servers in the LAN or over the Internet.The WDTV box could have a lot more within. It plays YouTube videos or Pandora Internet Radio streams with least effort. 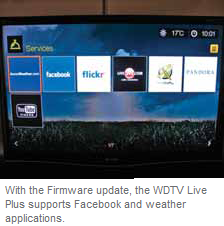 With the new Firmware version 1.04.10 dated 13.1.2011, it now supports Facebook, Blockbuster on Demand, Deezer, Flingo and AccuWeather.com as well. You would now probably wonder how you can manage your Facebook account with the WDTV remote control. Well, you do not have to! You can now connect a keyboard to the USB port. This will make not only Facebook easier to operate, but it will also be much easier to surf through YouTube videos since you no longer need to select the particular alphabets using the remote control. Furthermore, you can now also download two ﬁles simultaneously. In theory, these features have always been there, but not used until now. The easiest way to update the ﬁ rmware of your WDTV box is a functional Internet connection during the device startup. The box checks whether a new ﬁ rmware is available at the time of every booting and asks whether you want to install it. If you click on ‘Yes’ (with the remote control), everything runs automatically without any effort.